Combine yeast with milk, sugar, salt, lemon, and vanilla in the bottom of a large mixing bowl. Allow to sit and foam up a minute. Mix in eggs. Add flour – enough to make a medium soft dough. Work in soft butter. Kneed in bowl or on table for 10 min. adding more flour if necessary. Dough has been kneeded enough when it is shiny and elastic and possibly has small blisters on the surface. Place in bowl dust top lightly with flour. Cover bowl with a towel and place in a draft free warm place (sometimes I flip the oven on its lowest setting for a minute, turn it off, and place dough in oven) to rise 45 minutes. Dough should almost double in size. Heat oven to 350 degrees. 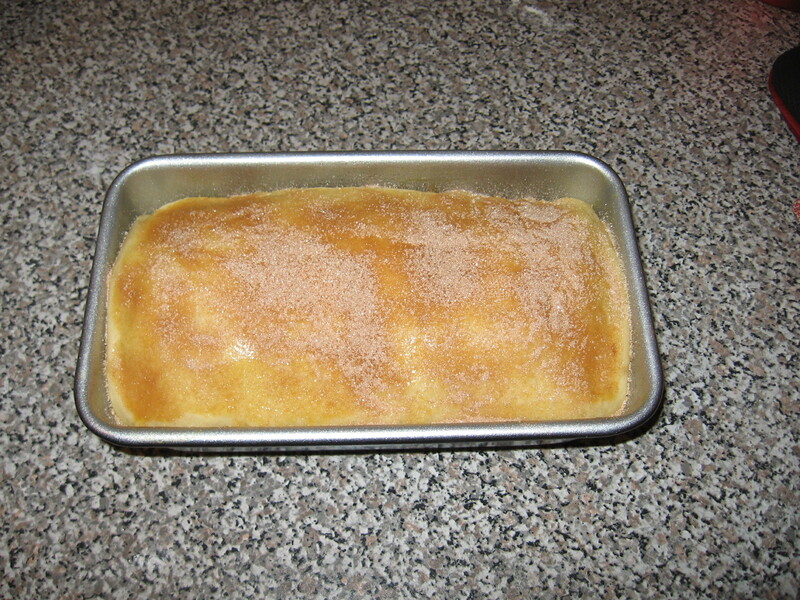 Grease a 9 x 5 x 3 loaf pan. Mix chopped apples with 1 tablespoon cinnamon sugar. 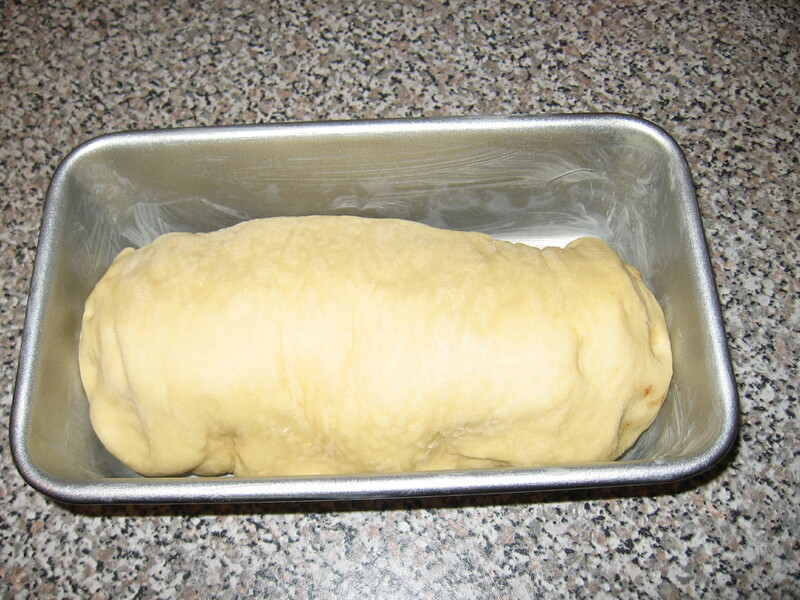 Punch down dough and roll into a large square or oval shape about 1/4 inch thick. Brush with melted butter. Scatter chopped apples over dough. Sprinkle with raisins. Sprinkle with cinnamon sugar (reserving about 1 tablespoon for later). 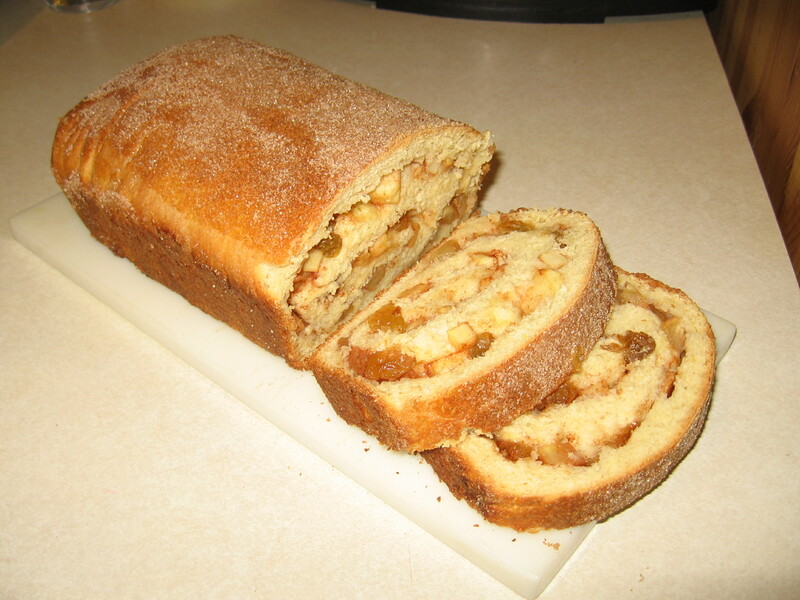 Roll dough up jelly-roll style. Fit into loaf pan. Let rise until dough has almost doubled. Brush with egg mixture and sprinkle with remaining tablespoon of cinnamon sugar. Bake in preheated oven about 45 minutes or until golden brown. Note: Cinnamon Sugar can be made by simply combining 1 cup granulated sugar with 1 tablespoon cinnamon.